Psychic Force is a fighting game series by Taito, unique in a way that the battle take place in a cubic space enforced with magical energies. Though it opens up for complete 3D battle, it utilizes a 2D battle system, except there's no ground and that your character constantly floats and dashes. Like the later Touhou fighting games, your character is able to throw projectiles on long range, or get close enough for melee attacks. You can also dash to graze through weak projectiles, but stronger attacks cannot be grazed through (unlike Touhou fighting games where even the strongest projectile can be grazed). The story of Psychic Force borrows heavily from the X-Men series, except that you replace Mutants with Psychics. These Psychics, called Psychiccers are shunned by normal people in general and that they're forced to face hate and discrimination on a daily basis, but an organization of united Psychiccers called NOA, led by a young British Psychiccer man named Keith Evans, rises to make sure that no Psychiccer are forced to face the harshness of the world. Unfortunately, the members of NOA tend to take things to the extreme, causing a small group of unaffiliated Psychiccers to form a resistance against them known as Anti-NOA so that they can oppose NOA's extreme ways. Of course, there are some fighters who are not affiliated with the two groups, yet they still hunt down the Psychiccers, claiming them to be a dangerous threat to the world. Psychic Force was then followed by an arcade sequel called Psychic Force 2012, which was ported to the Dreamcast and later got a PlayStation port titled Psychic Force 2. The story takes place two years later after the first Psychic Force, whereas Richard Wong broke away from Keith and formed his own Psychiccer organization called The Army, whose ambitions are far more extreme than NOA (now called Neo NOA). Three characters: Sonia, Brad, and Genma were removed from the roster but had received their own successors. The three of them would eventually be brought back in Psychic Force 2 as exclusive characters to that specific title. The sequel itself would also sport out a brand new cast of characters with some returning ones. 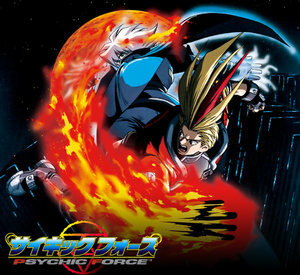 Both games saw a re-release on PlayStation 2 in 2005 with the Psychic Force Complete compilation that, unfortunately, stayed in Japan. Interestingly, Taito has re-released Psychic Force 2012 for arcades, using the NESICAxLive system found on many cabinets that utilize their Type X boards, as well as upgraded HD graphics. Psychic Force, while not commercially successful at the time of its initial release, did manage to gain a strong cult fanbase. It had also spawned a 1998 2-episode OVA. A Character Sheet for this game is in works. Contributions are welcome. For games with similar gameplay to Psychic Force, compare and contrast to G.rev's Senko no Ronde series (developed by Taito's former employees) and Orange_Juice's Acceleration of SUGURI (a spin-off series of SUGURI). Age Is Relative: In 2010, the other characters tend to treat Emilio like a little kid when in fact he's 14, only a year younger than Wendy. Puzzle Taisen (see Lighter and Softer) takes this Up to Eleven for humorous effect, but it makes it all the more shocking in 2012 when he grows out of it with a vengeance. The Anime of the Game: It had a two-episode OVA in 1998. Anime Theme Song: In the PlayStation versions of both games. Psychic Force's opening is "On the Verge of Revival " (full song ) and Psychic Force 2's opening is "The Legend ~a dying hero's story~ " (full song ). In case you're wondering, that is in fact Hironobu Kageyama, one of JAM Project's founding members performing the vocals, and it is AWESOME! Anti-Villain: Most of the NOA members, except Wong, even before the formation of his Army. Attract Mode: The games feature them if you wait at the title screen. Cast from Hit Points: In Psychic Force 2012, players can perform a Hyper Charge that not only refills Psy but also sacrifices life for Power. Compilation Re-release: Psychic Force Complete as mentioned above. Crucified Hero Shot: Emilio does one in the opening of the first Psychic Force. Downer Ending: Needless to say, nobody gets a happy ending, their stories always end in a sad note, for them or for the world. Wong does get a happy ending, for his own, but the world is doomed. Bittersweet Ending: Two endings stand out where Wong ends up getting killed. Might kills Wong for good, but then suffers Heroic RRoD right after remembering that he also killed his creator/mother and best friend, Patty. Wendy also ends up killing Wong and succeeded in saving Burn. However, in process, she also killed Emilio and she swore to change the world for good as an exchange. Playing with Fire: Burn and Regina. Shock and Awe: Sonia and Might. Dishing Out Dirt: While not exactly their main forte, Brad and Gudeath seem to utilize rocks in their arsenal. Make Me Wanna Shout: Patty. Gravity Master: Brad and Gudeath. Giving Someone the Pointer Finger: In the first game's character select screen, Sonia's portrait depicts her pointing to the player. The Good, the Bad, and the Evil: Anti-NOA is Good, NOA is Bad, Wong's Army is Evil. The monk/priest magicians (Genma/Genshin) don't take sides. Gates also used to be not taking sides, until Keith captures, reprograms and drafts him into NOA. "I Know You're in There Somewhere" Fight: Burn only wishes he was having one with Keith, but in Psychic Force 2012, Wendy has two of them: with Emilio and, oddly, with Gates. Cloud Cuckoolander: Brad's good side (notable in the only installment of the series where his good side gets appreciable screentime). Corrupt Corporate Executive / The Scrooge: Wong, because it turns out that no one bought him any toys when he was a child. Green Aesop: More green than aesop, but there is a notable theme of energy crises. Keith's Lighter and Softer plan is for Psychiccers to save the planet by volunteering their powers as a clean, renewable energy source. Never Say "Die": Surprisingly averted (especially in Wong's story), but unlike in the canon games, no one ever seems to be Killed Off for Real. Running Gag: Emilio cries "It's all because of this power!" at the slightest provocation. In his Story Mode something triggers it every single round, until by the end it's hard to take the line seriously ever again. Lethal Lava Land: Both games feature a volcanic arena. In the first game has a stage above a volcano and in the second game there's a stage taking place by a volcanic ravine. Mana Meter: Your Psy Meter. In the first game you have fixed amount but in the second game, the more life you lose, the more Psy you can use. You can also trade life for Psy and Power with a Hyper Charge. Ring Out: It's possible in Psychic Force 2012 by hitting your opponent into walls of the arena hard enough so they break through it. RPG Elements: Psychic Force 2 featured a "Psy-Expand" mode where you can level-up your characters and give them custom move-sets by using moves from the other fighters. Shout-Out Theme Naming: Burn and Keith are named after the player characters from Riding Fight, a previous Taito game made by the same developers. Updated Re-release: The PlayStation version of Psychic Force 2012 has degraded visuals and lower frame-rate but makes up for it with an extra Psy Expand mode and brought back some of the characters from the first game. Victory Pose / Victory Quote: Present in both games after beating your opponent.